Wolverhampton will once again pay its respects to the Dutch soldiers who were stationed at Wrottesley Park during the Second World War at a special ceremony. The city's Mayor will lay a wreath at the annual Dutch War Graves Service of Remembrance at Jeffcock Road Cemetery on Saturday November 10th, 2018. The poignant service, organised by the Royal British Legion, remembers soldiers from the Princess Irene Brigade who are buried at the cemetery. The Princess Irene Brigade was stationed in an encampment at Wrottesley Park from 1941 before they took part in the Normandy D-Day landings which began the liberation of Western Europe. They were also the first Allied troops to enter The Hague. The Brigade was disbanded in 1945 and since then veterans, accompanied by soldiers from its successor regiment the Guards Regiment Fusiliers Princess Irene, make the pilgrimage to Wolverhampton on the weekend before Remembrance Sunday to honour their Dutch comrades. Former members of the Princess Irene Brigade were granted Freedom of the City in 2006. The Mayor said: "There's a very special relationship between the people of Wolverhampton and the veterans of the Princess Irene Brigade and it is an honour to be invited to lay a wreath to commemorate their sacrifices." 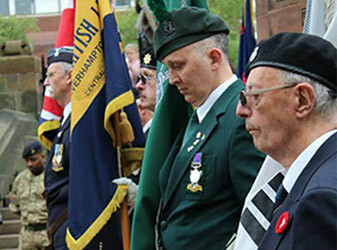 The Remembrance service takes place at 10am and will be preceded by a short parade which will form up at 9.40am. It will feature a roll call of the fallen and members of the public are welcome to attend. The Chair of the Royal British Legion's City of Wolverhampton Central Branch, said: "The Princess Irene Brigade was formed 77 years ago, and part of it was stationed here in Wolverhampton. "The Service of Remembrance will be attended by war veterans, active serving officers and fusiliers and dignitaries from the Royal Netherlands Embassy as we pay homage to our brave Dutch Allies from the Second World War."